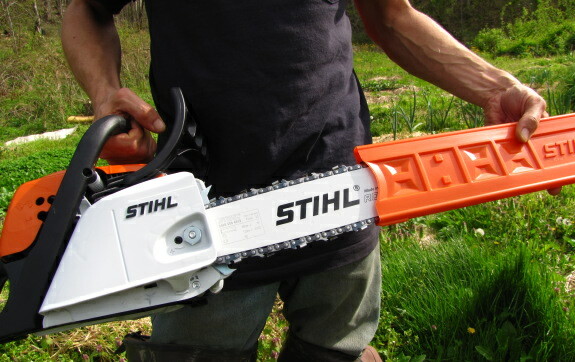 Our new Stihl MS 211 chainsaw is about to turn a year old. The smaller size really comes in handy for stump removal, and the newer engine has about half as much exhaust fumes to breath in. I've had a few instances where I felt like it was underpowered, but that was more the fault of a dull chain, and I had a small learning curve with the starting procedure. It took me a while to figure out when you push the choke all the way down it sometimes springs back up if you're not paying attention. My husband and I just completed a apprenticeship and are off to start our own homestead/farm. We are slowly trying to accumulate the necessary equipment. If we were only to have one chainsaw would a smaller one be do-able? Is a smaller one any safer? Emily --- Choosing a chainsaw depends on what you want to do with it. The bigger ones have more power and can have longer bars, which means they cut through bigger trees. On the other hand, they're more exhausting to use, which can mean less safe if you're not paying attention. If all you're going to be doing is cutting down trees less than two feet in diameter and cutting some firewood, a small saw would probably work great. But if you're going to be building a log cabin out of big trees, you'll want a big saw! Good luck with your new farm! I just picked up a Stihl MS250 a few weeks ago. It's a great saw as far as size, weight, utility, etc. I only have a few issues... one is the lack of a primer bulb. I find that irritating. Another is if it's been sitting in the heat, it gets difficult to start. Other than that, it's been a great saw the couple of times I've had to use it. Shannon --- Congratulations on your new saw! Ours is similarly not as easy to start as we'd thought it would be. It's not terribly hard, but we thought it would be easier. My MS 211 C has been a good little work horse for three years. It has been serviced and chains sharpened when needed. Have brought it to the mechanic due to a choking instead of reving up when pressing the point finger lever. Have taken the air filter off to see if it makes a difference. Ones the engine warms up it seems to settle but with a cold motor it doesn't like to be reved up. Instead it sounds like it is bogging down and follows with stopping. Any one else experiences problems like this bogging down? Marion, I've just had what sounds like the same problem. A technician has stripped down the engine and shown me score marks on the piston and I can also see that the piston rings are stuck in their grooves - which therefore means they are not in contact with the cylinder walls. Consequence: loss of compression in the cylinder means that, although it will start, it has no power. Sadly, he tells me it is a sign of overheating on a hotspot in the cylindere! Cost of repair is almost the cost of a new chainsaw! !